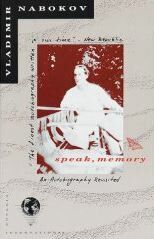 This page contains notes I made during a recently completed (albeit frequently interrupted) reading of Vladimir Nabokov's autobiography Speak, Memory. I made these notes while reading to make it easier to "catch back up" if I had to set the book down for extended periods of time, which as it turns out was invariably. As Nabokov clarified in his Foreword to the 1966 revised edition, each chapter had already appeared as a magazine article. Article titles, dates, and the publications in which they appeared are noted under each chapter number. Aside: My loss is geographic, not financial, got it? Great Dane - Escape to the woods!